GetDivorcePapers.com provides professionally completed, 100% court-approval, money-back guaranteed Maine divorce forms. Just create an account, complete the interview, and file for divorce. Our case managers do all the work for you, and send the completed Maine divorce forms when they are ready to be filed. 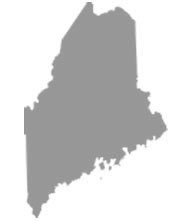 When filing for divorce in Maine, one of the two must reside in, or the grounds/ reasons for divorce should have taken place in Maine. Or, one of the spouses should be resident of Maine for a minimum of 6 months. Any one of the spouses can file for divorce in the District Courts of the county in which they live, but the other spouse will have the right to get the proceedings relocated to Superior Courts. Any kind of substance abuse. Incurable insanity and confinement for 7 years or more. Deserting the spouse for a period of three years or more. There are three types of custodies granted in Maine, based on the best interests of the minor. All responsibilities, concerning the child's welfare, are divided; either all to one parent, or proportionately. These responsibilities include home, support, education, health care, religious and moral upbringing and parent child contact. Parents are required to inform the other parent about any major changes. Either one parent can have exclusive responsibilities or both can share responsibilities and make joint decisions. Parent's motivation to love and guide the child. Length of time the child has been living in a safe, satisfactory environment. Stability of the living conditions of both the parents' houses. Any history of domestic abuse against the child. Effect of sole custody on the child. If the child is underage or in infancy. Contribution of each spouse towards the purchase of the asset, including their contribution as a homemaker. Value of each spouse's individually held properties. Financial condition of each spouse at time when the property is being divided. Any one spouse may be ordered to pay a sufficient alimony to the other partner. In some cases, the other partner's property might be given to the partner to be paid alimony to. In some cases, the spouse may also be awarded transitional support for short term needs. There are many factors that this decision depends on, including length or marriage, age of the spouses and their financial and vocational conditions. Age of child, if over 12. Standard of living of the child, and how to maintain it. Child's physical, emotional needs and other relevant factors. If one of the spouses declares that there are no irreconcilable differences, or if the divorce is challenged and children are involved, meditation and counseling are a must in Maine. There is no need of a lawyer when applying for divorce in the state of Maine. A divorce case which is filed without any help of an attorney in any of the states is known as Pro Se Divorce. Literally, Pro Se is a Latin phrase and it means "on her or his own". Process of getting the divorce without the help of lawyer may vary from one State to another. These types of divorces are perfectly legal and enforceable in Maine, and are actually very convenient. Usually, once settlements have been made regarding property distribution and custody matters among the spouses in case of a mutual divorce, Pro Se Divorces are filed.